U.S. Sen. Bob Corker speaks to students at the STEM school on the Chattanooga State Community College's campus on Nov. 9, 2015. 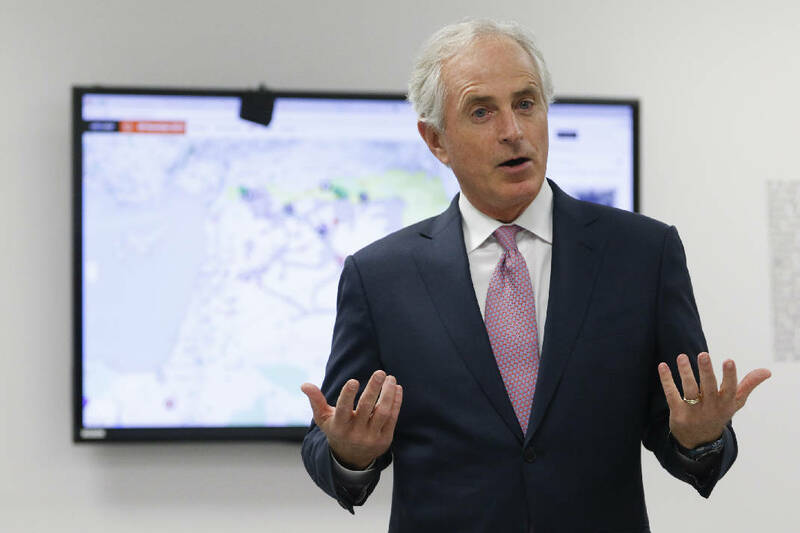 The Campaign for Accountability has filed a supplemental complaint about trades made by Sen. Bob Corker that involved Chattanooga-based CBL, which they say he failed to properly disclose. NASHVILLE — A Washington, D.C., group announced today it has filed a new ethics complaint against U.S. Sen. Bob Corker in which it alleges the Chattanooga Republican "concealed information" about his financial stakes in two Chattanooga-based funds, as well as one based in Memphis. The Campaign for Accountability filed its second complaint with both the federal Securities and Exchange Commission and the Senate Select Committee on Ethics. The group charges the Tennessee senator and businessman "may have shared information — gleaned through his position in the Senate — with hedge fund managers for his (and possibly their) personal financial benefit." Corker's office blasted CfA's newest filing as "yet another baseless accusation by this political special interest group. Campaign for Accountability says the complaint is based on new filings made by Corker after questions were initially raised last year about his not having divulging full details in his frequent trading in Chattanooga-based CBL & Associates Properties stock. The CfA filed a complaint at the time, accusing Corker of insider trading. Corker is the third ranking member of the Senate Banking Committee. Ethics and SEC complaints can drag on for years. In its new complaint, CfA says that since the initial issue over his CBL disclosures, Corker has filed amendments to his personal financial disclosure forms "indicating additional potential violations of the law. Most seriously, based on Sen. Corker's apparent effort to conceal the underlying assets of funds in which he invested, CfA believes Corker may have shared information — gleaned through his position in the Senate — with hedge fund managers for his (and possibly their) personal financial benefit. "The fact that the senator has longstanding personal relationships with those who manage these funds — who also have donated generously to his campaigns — lends further impetus to the need for an inquiry," CfA says. "Sen. Corker hasn't just made a mockery of Senate disclosure rules, he may have committed a crime," said CfA Executive Director Anne Weismann. "Authorities should investigate why Sen. Corker was so intent on hiding the underlying assets of these funds that he filed inaccurate disclosure forms year after year." Corker's office called the claims "categorically false and nothing more than a smear campaign." "When amending the senator's financial disclosure report, our office worked directly with the Senate Ethics Committee to ensure items were reported accurately and in line with Senate guidelines," his office said. The Wall Street Journal, which initially raised questions about Corker's CBL disclosures, also reported in December that Corker had amended his disclosures to disclose information about the hedge funds. They showed Corker invested in funds managed by three Tennessee-based firms: Chattanooga-based TSWII Management Company and Pointer Management LLC, as well as Gerber/Taylor Management Company of Memphis. "In some cases, letters written by Gerber/Taylor that Sen. Corker submitted to the Senate ethics committee appear to confirm that not all of the funds in which the senator invested had more than 100 participants," CfA says in its news release. "In other cases, forms submitted by the hedge funds to the SEC, reveal the funds had fewer than 100 investors. CfA says that since 2004, the top employees of Gerber/Taylor, TSWII, Pointer, and their families have donated $204,020 to Corker's Senate campaigns and $75,000 to his leadership PAC. The founder of TSWII, L.H. Caldwell III, was among the co-chairs of Corker's campaign committee ahead of his 2006 election, CfA pointed out. And since 2004, Caldwell and family have donated $73,280 to Corker's campaigns and $20,000 to his leadership PAC. CfA says Caldwell's three younger children made 13 contributions to Corker's campaigns between December 2004 and March 2011. The occupation of the children reported to the FEC for these contributions was "student" and the address provided was for the Caldwell family home in Lookout Mountain "even when they had jobs and lived elsewhere, raising questions about whether Mr. Caldwell was the real donor." Last year, Corker blamed problems with not reporting all information on CBL trades on his accountant's misunderstanding of new Senate disclosure requirements. A Corker spokesperson at the time accused CfA of engaging in a "smear."